Stephen F. Austin State University College of Liberal and Applied Arts Associate Dean Dr. Mark Sanders, professor of English, won the 2018 Nebraska Book Award in the nonfiction biography category for "The Weight of the Weather: Regarding the Poetry of Ted Kooser." NACOGDOCHES, Texas - Stephen F. Austin State University College of Liberal and Applied Arts Associate Dean Dr. Mark Sanders, professor of English, won the 2018 Nebraska Book Award in the nonfiction biography category for "The Weight of the Weather: Regarding the Poetry of Ted Kooser." Sanders' book is a collection of interviews, literary memoirs and critical analyses of Kooser and his poetry. Sanders established himself as one of the first scholars on Kooser's poetry when he began conducting studies and interviews in 1977. "Kooser is a writer of the particular - things and specific places and people in those places, all of them special because they are unique and common," Sanders said. "I've been working with Kooser's poetry for 40 years, but I started writing 'The Weight of the Weather' about 10 years ago. No one had written anything of substance on Great Plains poetry, so I thought I might." Sanders, a Nebraska native, feels a deep kinship to the state, its people, and its artists and writers. Sanders said, "I was born, raised and educated in Nebraska, so this award holds a special place in my heart. "The Nebraska Book Award proves that hard work, perseverance and a love for the particular can be rewarding. My book has been called a labor of love by such poets as Dana Gioia and David Baker; I think they're right." This is the second Nebraska Book Award Sanders has received. In 2016, Sanders' edited collection, "A Sandhills Reader: Thirty Years of Great Writing from the Great Plains," won in the anthology category. In addition to his recent honors, Sanders served as a primary consultant on a book that won the 2018 Nebraska Book Award in the anthology category. Edited by Daniel Simon, "Nebraska Poetry: A Sesquicentennial Anthology 1867-2017" assembled all significant poets associated with Nebraska and its literary legacy. Simon was instructed by Kooser and other poets to contact Sanders, as he well understands the Nebraska literary topic. Sanders personally knows many of the state's poets and helped Simon contact them. "I am part of that writers' community, and Daniel asked me to assist in his project because I could recommend poets and poems for the book," Sanders said. Sanders was able to witness the production of the anthology, from the setup of pages and copyediting alongside Simon to the selection of photographs. "The experience was very fulfilling, as I saw the book grow and evolve, and I enjoyed the dialogues Daniel and I had about Nebraska poets," Sanders said. "The whole experience was like going to a family reunion and actually having a tremendous time." Sanders has published poetry, fiction, creative nonfiction and literary criticism in the United States, Canada, Great Britain and Australia. He has received numerous awards and recognitions for his work. 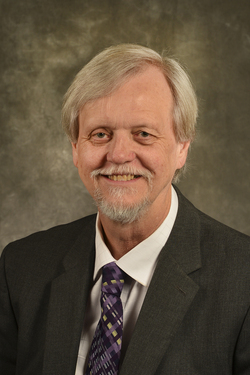 To learn more about Sanders' work, contact him at sandersme1@sfasu.edu or (936) 468-2087.